We are pleased to report that in January 2018 we received planning permission for the final garden design layout from Torfaen County Borough Council. Below, we describe the key features of the design, how these were decided upon and our plans for taking the design forward. subject to Planning Permission. Source: BDP. Over the summer of 2016, we held a number of events to share our initial ideas about the layout. These were themselves informed by our earlier stakeholder events asking what the public would like in the garden. We also ran a survey on this website. Details of the first draft shared at these events can be viewed at our Garden Design – First draft 2016 page. We had a good response to our survey. The vast majority of people liked our ideas and offered many useful and constructive comments and suggestions. 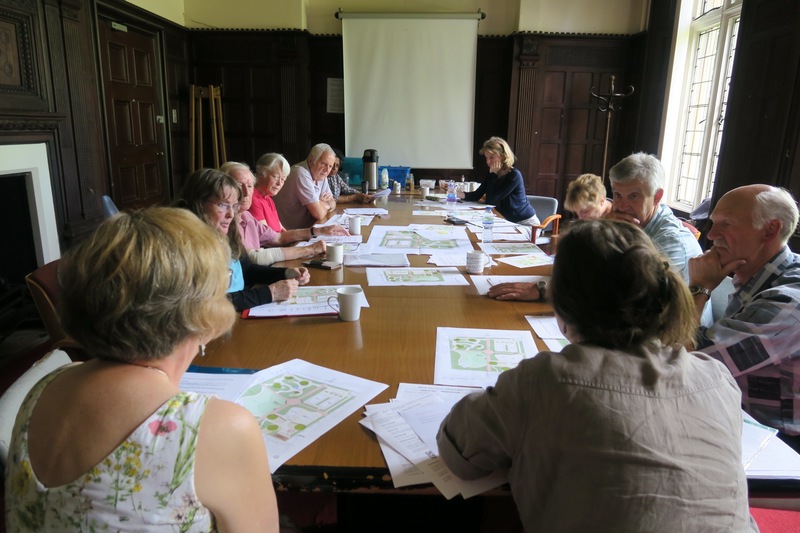 Since then, the process of developing the garden design has involved a number of workshops held with our volunteer Garden Design Team. Along with their own thoughts and experience they considered all the feedback we had received and worked hard to incorporate the ideas and suggestions put forward. We have been assisted in this exercise by the landscape architects (BDP) engaged by Aneurin Bevan University Health Board on the new Grange University Hospital. They have translated our drawings into the professional garden scheme above. Swapping the positions of the ‘Reflective’ and ‘Productive’ quadrants to make the busy, working areas of the garden more efficient for volunteers to work within. It was suggested this would also ensure people wanting peace and quiet in the reflective area would not be disturbed by the hustle and bustle of gardeners and visitors moving across the rest of the garden. Ensuring we built in plenty of shelters for people visiting the garden as it is a big space. 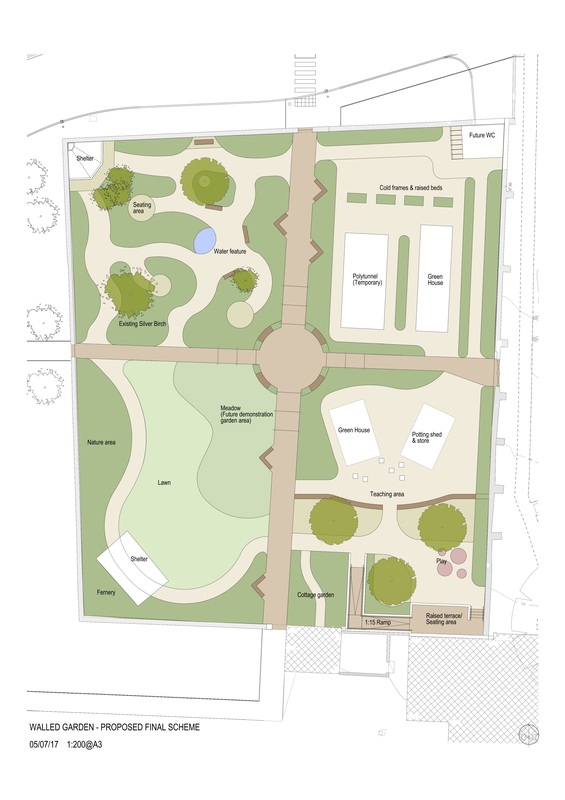 Lots of people asked that the reflective quadrant be made a sensory garden incorporating plenty of texture and colour, scented plants and gentle soundscapes such those created by running water, bamboo and tall grasses. The reflective area probably received the most comments from respondents. It was felt important to break up the original layout to incorporate more quiet corners for people who might want to sit quietly on their own. The new layout has tried to address this. The most popular suggestions for the central area were for a water feature, an arch such as a pergola, or a sculpture. As we plan to provide a water feature in the reflective area, we have opted to place arches at the central intersection of each path to help bring the whole garden design together. These will have ornamental climbers grown over them. The centre will be a flat circular area, bounded by low brick walls, which may be enlivened by some sort of design on the ground. We agree that it would be great to have some interesting sculptures and other art works in the garden and believe these could be placed anywhere in the garden to create particular focal points. We also plan to incorporate some signboards describing the history of the Llanfrechfa Grange site. The work of our Garden Design Team is not yet done. Over the next few months, they will continue to develop the detail of the design, e.g. deciding materials for the hard landscaping features, considering the planting schemes and thinking about the other features such as seating, lighting, water and signposting. Garden Design Team hard at work! We will keep you updated on progress through these web pages and our regular newsletter. We hope you like the final design. Our thanks to everyone who has contributed so far. If you would like to tell us what you think then please use our comments form on our Homepage. If you would like to get more involved, you can contact us via our Supporting Us page or via email or Facebook.